We went to our favorite dairy bar the other day for a lobster roll and an ice cream cone. They had computer monitors for their menus, and they were pretty nice. 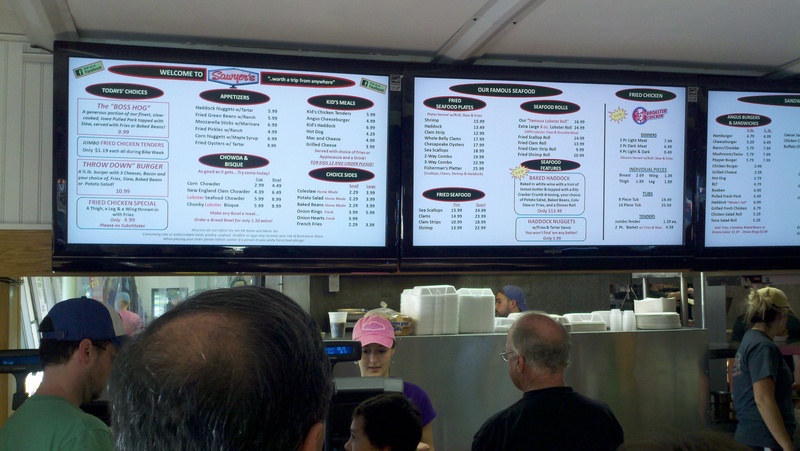 The advantages of electronic menu signage is that, first of all, you pay for it once. From then on, it’s just a matter of changing the information in the computer and you have the changes posted immediately. Of course, the cost of a computer screen is a lot more than a poster. But, it probably pays for itself over the course of a few years. Less so if you add in the power usage of the computer and the rest. An additional dollar a day in power cost goes a long way to buying a set of poster menus over the course of the summer. The cynic in me wonders if the real reason they use these electronic signs is that they can change prices back and forth. For instance, we went there during Bike Week in New Hampshire, and I’ll wonder if they put a buck on the prices when they know they are going to be jam packed anyway. They can experiment with prices, add specials, etc. very easily. The other thing to think about, computer reliability being what it is- what do you do if the system breaks down? You’ve got a line out the door and nobody knows what the prices are. Yikes! One great thing about a printed poster size menu is it always works.